Wheat, the staff of life? Although there are lots of exotic and nutrient-dense alternatives to wheat, for those of us with gluten issues, rice seems to take center stage as our go-to, gluten-free grain. I often have a batch of cooked rice in the fridge to use in everything from soups to salads to hot cereal. When you can’t eat certain foods and grabbing something on the go is difficult, having already-cooked staples available makes life much easier, don’t you agree? I’ve been thinking of doing a series of posts on alternative grains and I figured I might as well start at the beginning — with rice. Once you realize that wheat is off your menu forEVER (as in the rest of your life and into the hereafter), you wander into this wonderful parallel universe of alternatives grains. Seriously, it’s so much more fun over here. Think about it, would you be baking with montina, mesquite or chestnut flour if you weren’t forced away from wheat? Or experimenting with teff, job’s tears, amaranth, or black japonica rice? So, let’s get on with life and enjoy the abundance; and I’m here to help you learn how to do that. We’ll start with rice. Hey, all you glutenized wheat-eaters, you can join us, too. This is a bipartisan blog, we’re an inclusive bunch. First off, the “minute” versions, the trolley car versions, the stripped white versions don’t count in my mind, so we’re sticking with whole grain rice, meaning the germ and bran are intact. When rice is milled it goes from brown to white. The outer bran layer of the rice is removed in a process called “whitening” leaving it much lower in nutritional value. Almost all the fiber and most of the B vitamins, magnesium, phosphorus, potassium, iron, selenium, and zinc are washed down the drain (or wherever the “waste” goes). Ugh, why do we do stuff like that?! Fiber is our gastrointestinal hazmat team so we want more of it, not less. For a detailed post on fiber, check here. 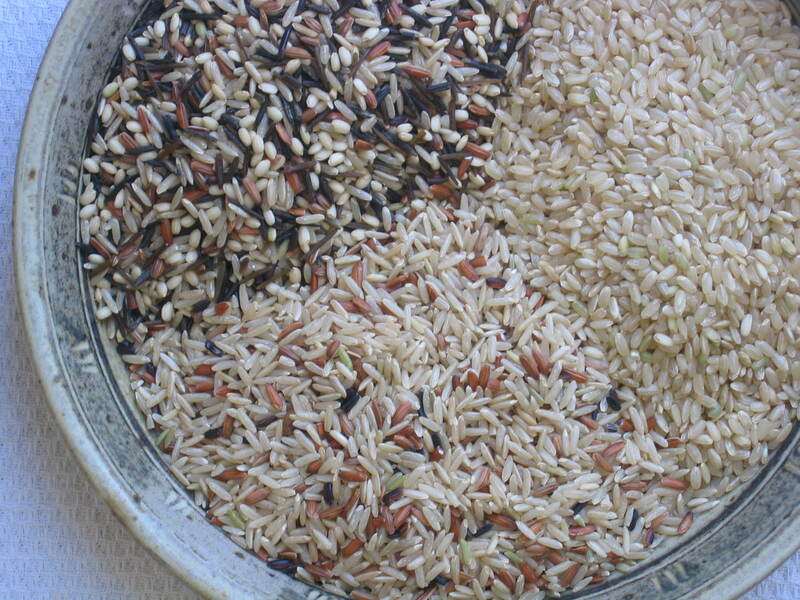 The bran layer is also what gives those lovely brown, red, and black colors to the different varieties of rice. Rice is categorized by the length of the grains — long, medium, and short. The shorter the rice is, the more chubby it becomes. Bummer, sounds a bit like a girlie trait. Rice contains two types of starch; amylopectin (sticky, gooey starch) and amylose (non-sticky starch). The short and medium grain rices contain more of the sticky amylopectin so they cook up differently. When the rice cooks, the amylopectin is released causing the rice to stick together. The solid brown rice in the picture above is “Golden Rose Brown” which is one of my favorites for making hot rice cereal (I’ll do a post on that). Think of it this way, the shorter and chunkier the rice, the more amylopectin and therefore the stickier the outcome. Long grain varieties have less amylopectin and far more amylose, so the grains don’t stick together. They cook up light and fluffy. Each grain is 3 to 5 times longer than it is wide. These are the super-models, tall and skinny. I love wild rice, partly because it’s so delicate and exotic and partly because of its nutty, savory flavor. Most of the “wild” rice I use comes from Lundberg Farms in California. The real thing grows wild in the Great Lakes, but that’s only a small percentage of the wild rice sold in stores. It’s actually an aquatic grass rather than a true grain. Rich in high-quality protein, vitamins, minerals, and fiber it’s not only pretty to look at, it’s packed with health-promoting goodness as well. Lotus Foods has several varieties of exotic rices. Short-grained Red Bhutanese is one of them. Grown at 8,000 feet in the Himalayans and irrigated with mineral-rich glacier water, this definitely qualifies for exotic. It has a beautiful red color and a mild sweet taste. Deep, dark purple, this rice was once grown exclusively for Chinese Emperors, hence the name. According to Chinese legend, Forbidden rice increases longevity and stimulates the flow of chi (energy). It has a nutty flavor and fragrant aroma. A blend of short grain black and medium grain mahogany, this rice is a Lundberg exclusive. It has a nutty, mushroom-like taste and looks beautiful next to a nice grilled salmon filet. Yum! • Never lift the lid while the rice is cooking or you’ll lose the steam necessary for tenderizing the rice. • It helps (but is not necessary) to soak the brown, red, black and wild rice varieties and hour or so before cooking. This entry was posted on Tuesday, January 27th, 2009 at 3:59 pm	and is filed under Celiac & Gluten Intolerance, Gluten-Free Recipes, Nutrition Therapy. You can follow any responses to this entry through the RSS 2.0 feed. You can leave a response, or trackback from your own site. M: Do you use a Rice Cooker? We used to have one, but just use the stove these days. My hostfamily in japan had a huge one that was constantly going…rice at all times. Come to think of it, we never had bread (except cake once in a while). Anyway, Rice cooker at Jory’s? Why/why not? In rice terms I’m the short grain chubby type However I am trying to do something about that and eat more healthy foods into the bargain. I love rice and would happily give up potatoes in it’s place… or so I think. It’s easy to say these things when more of less everything is available. For a start potatoes for me mean butter or lots of oil… a dry baked potato is a sad thing without trimmings. Previous to your fantastic post, I’d never heard of purple rice so I’ll see if we can get it in the UK. Rice puddings are also something I love with lots of nutmeg and I think my mother used to make biscuits with ground rice. I seem to buy a lot of arborio and organic basmati, perhaps it’s time to give the others a try. I’ve been out to buy some quinoa today since Britain’s leading culinary light (wonder who that could be? ) suggested it… I have great expectations so hopefully it will become a regular purchase. You’ve probably got loads of recipes for peanut cookies with soy flour… but if not then I’ve tried one that I liked a while back and would be happy to give details. Thanks for all the information Melissa, I love learning about the content of food stuffs. Come to thin of it, I don’t do nearly enough with wild rice these days… gotta remedy that. Hey Christopher — I do have a rice cooker, but don’t use it. (I should probably toss it or recycle it or whatever you do with questionable cookware.) The rice cooker is made with teflon, which is not a healthy choice to cook with. Teflon emits a toxic gas when heated to high temperatures. Aside from the nasty “tetrafluoride” stuff, I like the way rice comes out cooked on the stove in either my all-clad or my enamel cast-iron pan. Cid — oh, but both potatoes and rice are worthy choices. Butter is fine, don’t let anyone tell you otherwise. I bet you Brits make the most wonderful rice pudding. I’m not a soy fan and don’t use it in any form (with the exception of some wheat-free tamari on occasion), so no peanut soy cookies for me. Now coconut flour — that’s a different story. Lo — I get hooked on wild rice and seem to use it in phases. I really like that Golden Rose rice and eat it for breakfast once or twice a week. I toast it, grind it, and cook it like oatmeal. YUM! What a great post you did here about rice! How wonderful. Rice is a staple grain in our house. We often make sticky rice to put in nori or just eat with soup. My ratio is 1 cup short grain brown rice and 2 cups sweet brown rice to 6 cups of water. It takes our family less than 1 1/2 days to go through a pot of it! Brown basmati is a favourite but wild rice reminds me of some bloody awful dishes from a bloody awful culinary period in the mid to late ’80′s. Everyone did a timbale of wild rice with a raspberry vinaigrette or suchlike, a real crime. I seem to remember a red rice called ‘camargue’ have you heard of that? Ali — I completely agree with you, I like mixing different brown rices as well. And thanks for mentioning nori — that’s a great way to combine rice with sea veggies. I’ve never thought of wild rice as an ’80s dish. But next time I make some I’ll put on my leg warmers and crank up Rock the Casbah. Or maybe Blondie. P.S. I’ve never heard of camargue rice. From France? Just found your blog from your nod on Burp! – congrats on your prize-winning tomato recipe! Almost as good as a blue ribbon at the state fair. I love what you’ve got going here. Great images, great writing! I will definitely be sending my gluten-free sister here. Forbidden rice is one of my newest best friends, by the way – chewy, nutty, exotic goodness! Great post, Melissa! Very informative. I eat rice, but sparingly. Sometimes I have an issue with even that. (I wonder if I should eat any grains sometimes, GF or not.) I really do want to get a food mill so I can grind my own rice flour very finely for baking and get away from using the Asian white rice flour so much. Jess — Welcome! And please do come back and visit. I agree, Forbidden rice is definitely full of exotic goodness. Hey Shirley — if you want more info about grains and you, email me your questions. I have a grain profile chart I created for presentations — if you want a copy, let me know. Yes, Basmati is great and like you said, very versatile. I like the Golden rose brown rice pictured above. Same thing, very versatile and it makes wonderful breakfast porridge. I just made lentil stew the other day with garam masala, sweet potatoes, and kale. YUM! TC — You’re welcome. I like Basmati too, but I’m currently on a roll with brown Golden Rose rice. I actually made some sweet porridge for breakfast this morning out of that rice. Yum, good stuff. Interesting post about rice. I really need to stop buying instant white rice! I do love Annie Chun’s sprouted brown rice microwave ready – a little expensive, but so quick when needed! Thanks for checking out my blog and good luck with yours! I love the pics of Colorado! I share your enthusiasm for the Golden Rose variety. It is the only one we use to make our Sprouted Brown Rice. We use a short-grain for the Sprouted Rice Flour…both are organic. Not sure if you have seen it for sale, yet? But, you can find it at Pearl St. and Superior Whole Foods in Boulder/Superior. We will be in Denver next week doing some in-store product demos…please stop by for a free sample and some GF conveersation.